Winter is now approaching and so the issue of cold weather is on many peoples minds. Bunnies handle the severe cold much better than they handle the severe heat. There are two basic issues you must be concerned about during the winter months. First, make sure your bunny has water available. During the winter months we go with crocks instead of water bottles for all of our outside rabbits. The tube of the water bottle freezes much too quickly. We then check the water three times a day to make sure the water is not frozen. If your bunny does not have enough water, it will not eat enough food to keep it warm. The second thing to consider is shelter from the wind, rain and snow. A wet rabbit cannot maintain the correct body temperature, and this is further compounded by the wind. Yes, wind chill factors make the rabbit feel even colder than the actual temperature. It is important not to completely block ventilation in barns and sheds. Ventilation in your rabbitry is just as important in the winter as it is in the summer. Insulating a barn for the winter will help keep the barn a little warmer. A balance between shelter and ventilation is important. 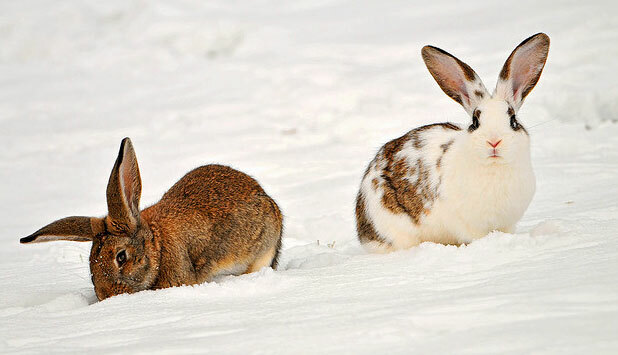 There are several other things you can do for your rabbits to keep them safe during the winter. We always give extra straw or timothy hay to our bunnies in the winter. This allows them to snuggle into the hay should the temperatures get really cold. Additionally, you can place nest boxes in all of your cages, as an extra place for the rabbits to snuggle into. This would be similar to a wild rabbit going into its den during extreme cold. Breeding through the winter can present a problem. Baby bunnies are born without fur. The mother compensates for this by pulling her fur and covering the babies. There are a couple of options available to winter breeders. Using a heat lamp, will give the additional warmth a baby may need to survive. Also, the nestbox could also be brought inside the house for the first two weeks. Of course the nestbox would need to go out to the doe once or twice a day so that she can feed her kits. After a couple of weeks they have enough fur to survive the cold temperatures, and will often huddle together or nestle up to the doe to stay warm. Heaters can be used to keep buildings warm. Keep in mind the extra cost of doing so. Often these are more for our comfort than for the rabbits. The nice thing about a heater is that water crocks won’t freeze as quickly, and the barn is a little warmer when you go out to care for the rabbits. Rabbits can survive the cold. Your diligence in making sure they have fresh water, greatly increase their comfort level and chances of survival. Rob Usakowski is the owner of Three Little Ladies Rabbitry, which is run by his wife Cathie and their three daughters. Visit their website atwww.threelittleladiesrabbitry.com for additional articles on raising rabbits.